Judge suspends El Chapo’s extradition to U.S.
Sinaloa cartel leader Joaquín “El Chapo” Guzmán may not be extradited until the end of 2016 – or later. The extradition of Sinaloa drug cartel leader Joaquín “El Chapo” Guzmán to the United States was temporarily suspended Monday by a federal judge in Mexico who accepted an appeal by the drug trafficker’s defense team. Experts say that as lawyers work to exhaust the appeals process, Guzmán may not be extradited until the end of the year, according to the AFP. “El Chapo” has been charged in California and Texas for a variety of crimes, including cocaine trafficking and money laundering. But Guzmán’s lawyers say that none of the cases meet the requirements under the U.S.-Mexico extradition treaty, arguing that some charges lack evidence and that the statute of limitations ran out on other crimes. 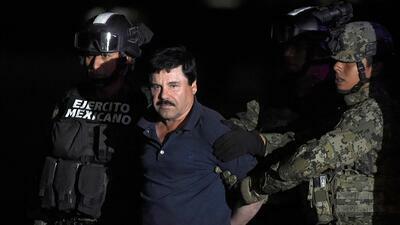 One of the attorneys, José Refugio Rodríguez, said that he hopes Mexico’s Supreme Court will rule on the extradition. On May 20, Mexico’s Foreign Relations Secretariat approved Guzmán’s extradition with the assurance that he wouldn’t receive the death penalty. The infamous drug trafficker was recaptured in Sinaloa state in January, six months after escaping from prison through a tunnel. Last month, authorities transferred him to a prison in Ciudad Juarez from the Altiplano prison in the State of Mexico.